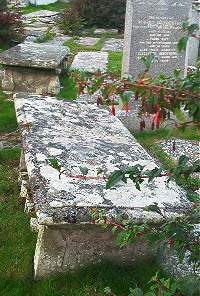 Peter Bain, farmer of Knockinnon, died 7th March 1852 aged 56. Wife Christina Henderson died 12th January 1858 aged 56. Son Kenneth Bain died 28th March 1898 aged 72. Wife Christina McKay died at Knockinnon 1st June 1912 aged 74. Son John Bain died in India 24th June 1895 aged 33. Son Kenneth Bain died at Kamloops Vancouver 26th July 1896 aged 23.